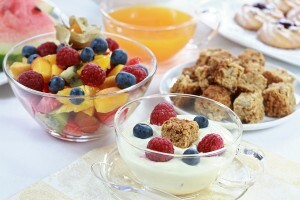 Is Your Healthy Breakfast Making You Fat? For decades, grains and other high carbohydrate foods have been the foundation of a healthy diet, while fats have been demonized. Only recently have diets like the Paleo and Ketogenic become more popular -- protein is in the spotlight and healthy fats are starting to get some attention. For those who do not know, the Paleo is a diet that attempts to mimic how our ancestors ate. It is built around eating high quality foods such as grass fed meat, free range animals, traditional fats, and little to no sugar (unless it comes from vegetables or small amounts of fruits), and it controls insulin levels. We know now through thousands of peer-reviewed studies that fat is not only healthy but essential! Saturated fats are actually crucial to a long, active, and healthy life. They may even help enhance your memory, rejuvenate your low libido and immune system, tighten and smooth dry, saggy skin, and boost your energy! Saturated fats target all these areas by renewing cells and eliminating free radicals, stop DNA damage, and defend your body against chemical and environmental pollutants. Ironically, eating fats also helps you burn fat! Fats are instrumental in the regulation of your overall hormonal balance, including many fat-burning hormones. When you understand how to choose the right fats, replacing high-carb (even those carbohydrates you have been told are good for you such as whole grains, wheat products, smoothies high in fruit, etc.) items in your diet with fat-burning, healthy "fatty foods," you’ll be well on your way to shedding pounds and flattening your belly. Here are some of the top "fatty foods" for a flatter belly: whole eggs, nuts (i.e. almonds, pecans, walnuts, and cashews), seeds (i.e. sunflower and flaxseeds), avocado, olive Oil, fatty fish (i.e. mackerel, tuna, salmon, and trout), and coconut oil. All of these "fattening" foods help to improve your overall fat-burning hormone balance and hungriness after a meal. They also possess a plethora of other unique fat-burning and health benefits. Yesterday I was out to breakfast and at the top of the menu highlighted were the “Healthy Choices” samples. Energy Bowl: this has granola or oats, fruit, and non fat vanilla yogurt (this is so high in sugar and one of the worst foods you can buy is fruited non fat yogurt - good luck trying to find whole milk yogurt). Sunrise Granola Bowl: same idea as above - insulin spiker. Tri-Athlete: this is an egg white omelet with healthy vegetables, whole wheat toast and fresh fruit - lets get off the low fat foods and cut down on the toast, jellies and fruit. All these choices start your day off in a high insulin, fat storing mode, starving in a few hours! Why are egg whites still on menus and why are people still ordering them? It is so frustrating to see low fat items still hailed as the optimum choice on heart healthy menus! Here are the facts on eggs and their yolks. Most people are totally confused and brainwashed into thinking that whole eggs are "bad" for you and that egg whites are somehow the epitome of health. And while there is nothing necessarily "wrong" with egg whites (they're a quality protein source), the YOLKS are where the majority of an egg's nutrition lies. The yolk contains more than 90% of vitamins, minerals, and anti-oxidants contained in an egg, all the fat, and it's super healthy, hormone-balancing fat (fat is not bad for you), and the yolk contains half the protein, and is actually needed to balance out the amino acid profile found in egg whites. Remember, fats will help you shed fat! Protein builds muscle tissue and stabilizes blood sugar and both together starts your day in a fat burning mode.